Where do you think this photo was taken including county, village and nearest cross road? Provide a rationale. West of Winchester Boulevard: Greg O. What is the estimated date of the photo? Provide a rationale. Based on Waldo's parked automobile, the photo is circa 1928. Since this Mystery Foto is still open (and may never be solved), please review the options below and comment on the most likely location. Howard, I know this mystery is a group effort and you will eventually explain why or why not our proposed locations would match this photo. I feel compelled to describe the locations in Suffolk, Nassau, and Queens. I drove through out Suffolk. *McCulloch Dr east towards E McLlane Dr- It's a east straightaway, then a southerly curve. But there are a few too many highs and lows regarding the grade of the LIMP. Of course the LIMP has widened, but I believe the natural grade remained the same to the present. 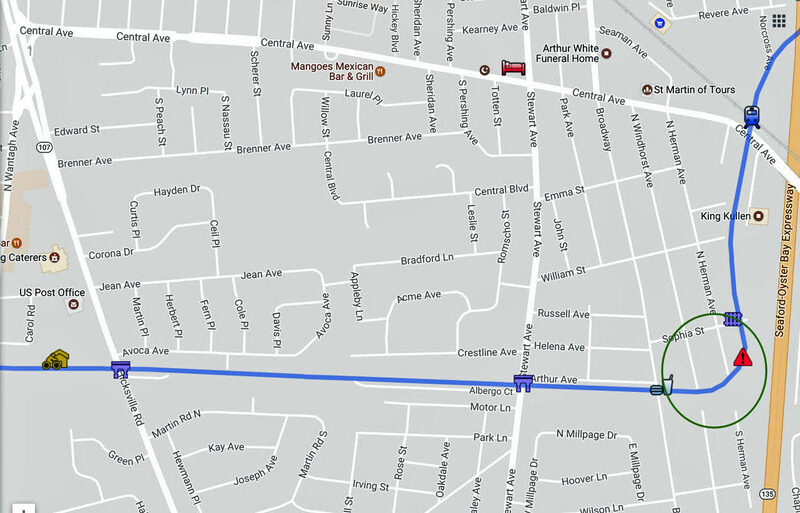 *Milford Dr east towards Hawthorne Ave- It's a east straightaway, then a southerly curve. The straightaway looks right enough, but the curve towards Hawthorne is too short/immediate. *Bridge Rd east towards Hoffman La- It's a east straightaway, then a southerly curve. This area "looked right" from an aerial. But with the interruption of the LIE, Vets Hwy, and Businesses; it's a tough one to prove. *Bedford Ave towards Old Nichols Rd- It starts out as an east straightaway, but the curve starts out as an "S" shape; and then sharply heads east towards Nichols. Doesn't really match the mystery photo. *Plainview Rd- We realize it was a north straightaway, then a east curve towards Plainview Rd. After viewing photos of this location, there's consistent guardrailing on the straightaway and curve. The mystery photo has no guardrailing on the straightaway. *Deadmans Curve #1- We realize it was a south straightway, then a west curve. After viewing photos of this location, there's also consistent guardrailing on the straightaway and curve. Again, the mystery photo lacks guardrailing on the straightaway. 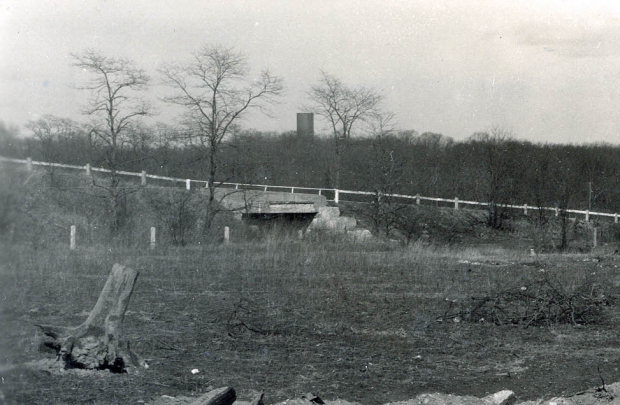 *Fresh Meadows Curve- View west, then northerly curve to Western Terminus. It looks convincing, but the north curve is more pronounced than the curve in the mystery photo. *E/O Springfield Blvd-View east, then southerly curve. Could be a candidate, the curve is similar to the mystery photo. *W/O Winchester Blvd- View west, then northerly curve. With the mounting evidence, I feel now this is the mystery photos location. Like I said before, this is a fun and group effort. These are just my own opinions after viewing everything. Motor Parkway at Milford Drive looking east towards the uphill curve. Whether I’m correct or not, I viewed the 1930 Airmap of Suffolk County….www.suffolkcountyny.gov to help me figure what section of the LIMP this may be. After viewing the LIMP from end to end, the following location made most sense to me: I believe this is the parkway due north, then bending east towards Hoffman La. Hauppauge Suffolk County NY. 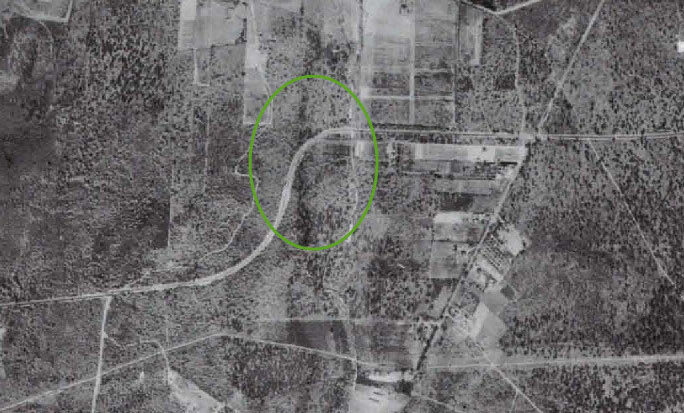 The roads that existed in this time period ( 1930 ) that would be S/W of this location are Hawthorne Ave and Bridge Rd. 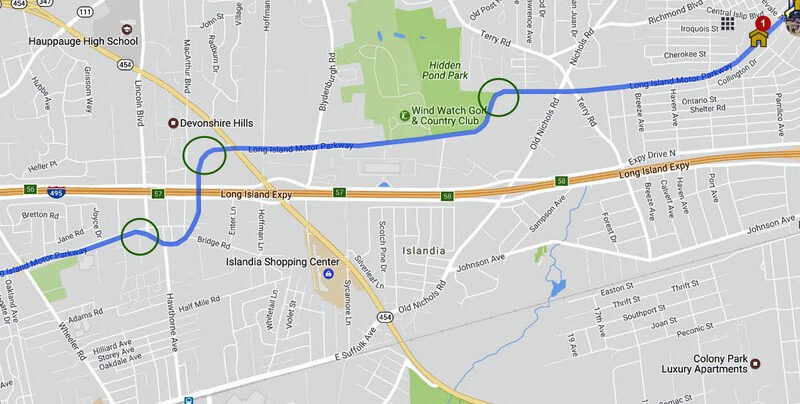 I’m know the parkway remained 16 ft wide in Suffolk County ( no concrete extensions here ). Pretty sure the guardrailing wasn’t always consistent. None on the straightaway ( railing makes sense for the immediate curve ). It’s also quite rural here ( As it appears on the 1930 Airmap ). Look forward to everyone’s comments! I’m back. After enlarging the 2nd closeup, I made out 2 concrete boundary posts at where I assume would be the W/S of the LIMP ROW. The big curve in Bethpage. That’s all I’ve got. 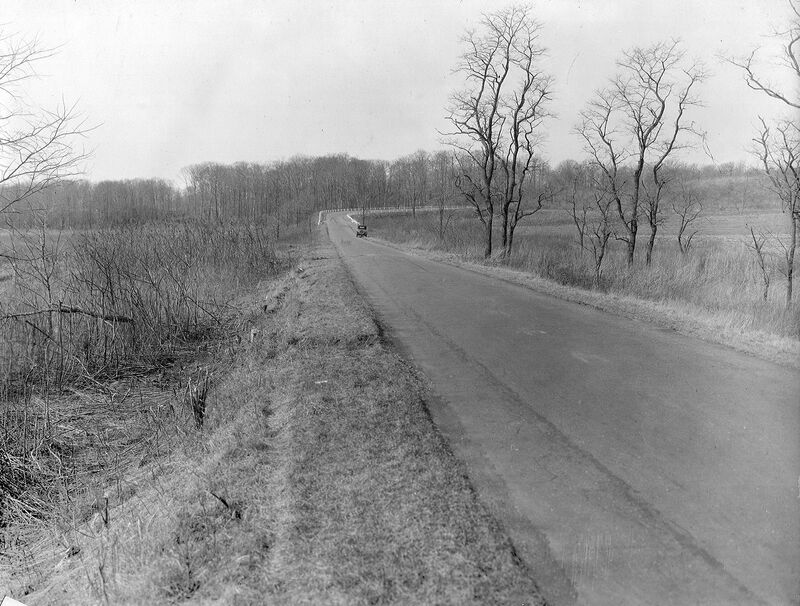 My guess is Deadman’s Curve #2, the Plainview Road turn, Bethpage, Nassau County, looking northeast where the Seaford Oyster Bay Expressway currently exists, and from the view of the car, taken about 1930. There’s something about the trees and terrain that says Queens to me. The curve and tree line look like they match the area just to the West of Winchester Blvd. The photographer would be standing on the west embankment of the Wheeler Farmway bridge looking West. The tree line would be where the Grand Central Pkwy is now. Waldo’s car looks like a 1920’s vintage, so guess on the date would be 1928/29. Mystery Foto #12 ... Could it be the Caroussel turn at Nürburgring… I doubt it but since there are about 80 different possibilities depending on the direction of travel I will go out on a limb and say east bound on LIMP east of Dix Hills Park where LIMP bends right between McCullock Drive and East McLane Drive close to present day Northern State Parkway. Or perhaps Big Bend at Lime Rock… Would you believe the Corkscrew at Laguna Seca? Based on the auto in the photo I would say the photo date is in the 1920’s. Not much to go by here so it will have to be wild guess time. There appears to be a shadow near the right-rear of the car which might indicate we’re looking in a westerly direction. So, if this is true, where is there a 90 degree turn to the north with trees in the background and fields on either side of the parkway? Could this be looking towards the Fresh Meadows area of Queens with the 73rd. Avenue bridge off to the right out of view and the Hollis Court Blvd. bridge behind the photographer? ( future site of Cunningham Park?) It doesn’t look like the three foot concrete extensions have been added yet, so I’ll guess about 1927-28 for the date. Nassau County, Bethpage, Plainview Road. Curve. Pure guess as there are about five locations with turns like this that it could be. I really doubt think it’s Queens and I’m pretty sure it’s not deadmans curve. 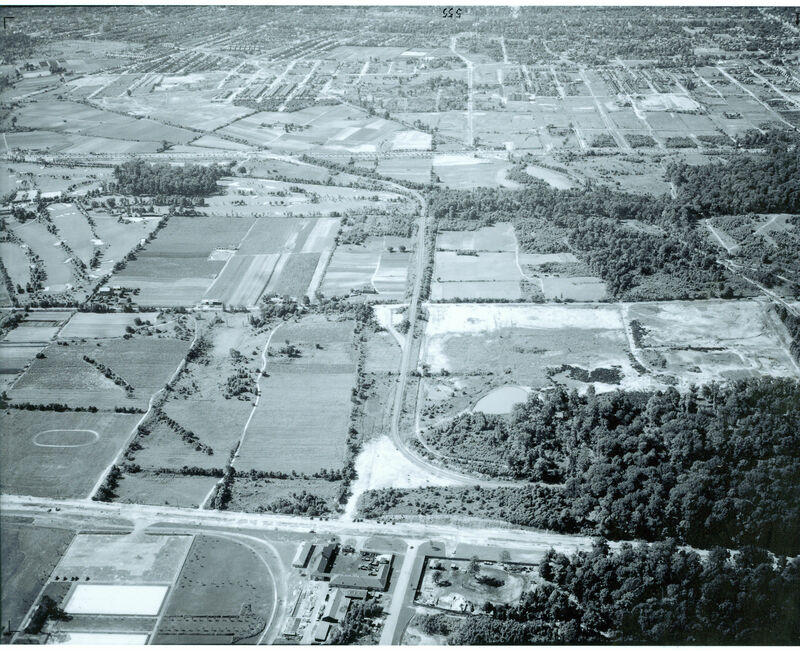 My guess is we are looking east over Roslyn road just over Robbins lane bridge and entering what is now the Wheatley hills golf course. I stared at this one for a while, and never posted. But now I am ready to add what I see. I am leaning with the West of Winchester pick. 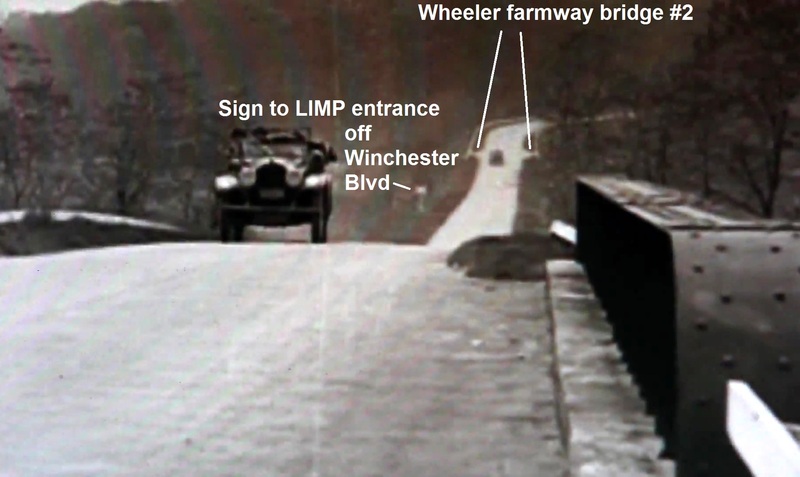 If you look only 4 seconds into the WC Fields Video, you can freeze it atop the Winchester original bridge looking west. The scene sure makes me curious. Notice, there almost seems to be a path where fence starts, just prior to the bend to the right. The same seems to appear just beyond Waldo. However, it is not as pronounced. In my opinion, due to the fact we do not have the same downward angle as the view in the film from atop the bridge. If we were to have “an envelope please” moment, then no doubt, this would be my pick. I hope someone reads this and responds. To add to my earlier comment. My first reaction was Queens. Why? Those guardrails look so familiar. Just like the ones just east of Winchester. Especially on the pictures regarding building the 2nd bridge. I am more convinced Greg O. had it right. Being that I live nearby, making a little field trip and taking some photos of the few locations in Suffolk County is in order. After printing out the 2 close ups, there’s a long hill in the upper right of 1 of the closeups. Area of Dix Hills has highs and lows regarding the terrain. 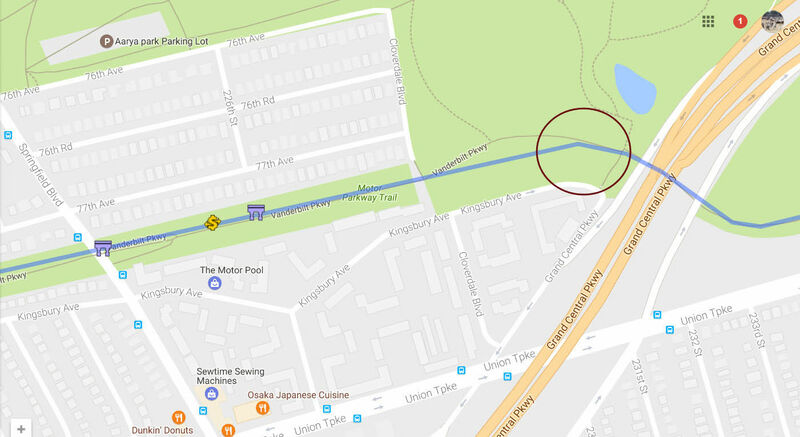 Another location may be where the LIMP was due north, then curved east across Bagatelle Rd ( Conklin Ave ). If so, then S/O the photo we would see Conklin and the LIMP side by side. 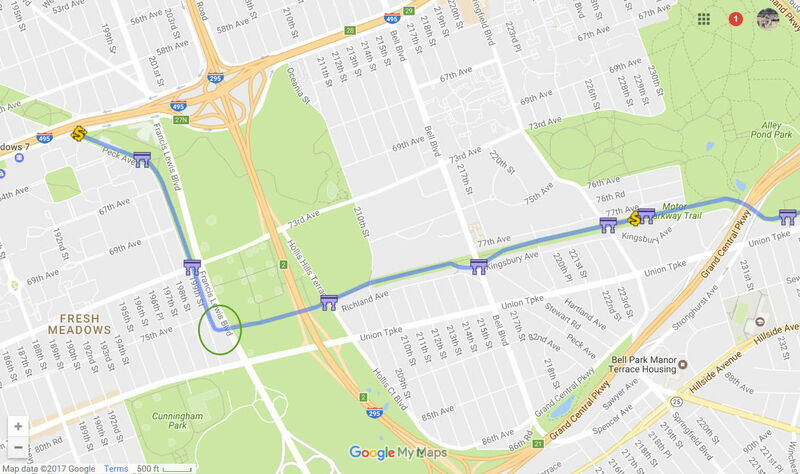 But Conklin veers to the east just before the LIMP makes the easterly curve across the unseen Conklin Ave. I’ll need to peruse thru Art Kleiners LIMP site, knowing that he’s hiked around here. Joe Oesterle - The 4 sec film clip is attached as a still frame pic. This pic shows strong evidence as the mystery solution, that continues to lean towards Greg Oriero. The main feature of the pic (besides the curve) is the Wheeler farmway bridge #2. 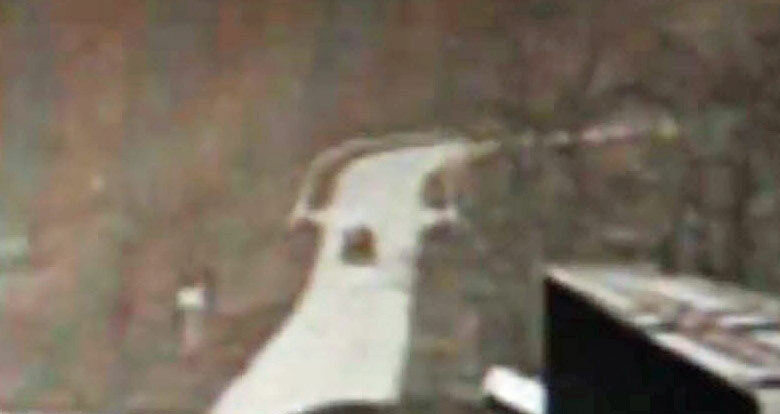 I can’t yet confirm this bridge was built on a LIMP slope (as shown in the mystery pic), but if it does, this location would be best candidate thus far, with supporting evidence to boot!. Anyone with quick access to this location can respond and let us all know. Love the detective work by all, thanks. 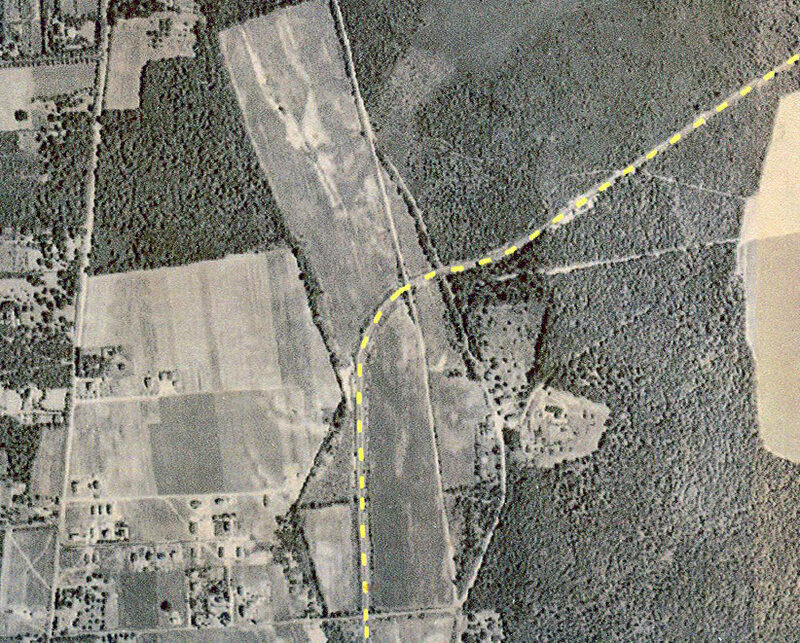 This was the original LIMP Winchester Blvd bridge (railroad type) as it was. A few things I wanted to add since I spent 3 cross-eyed days looking at 1920’s tree patterns at every turn of the LIMP! If you look at either side of the downward sloping roadway in the mystery photo, there appears to be open fields. 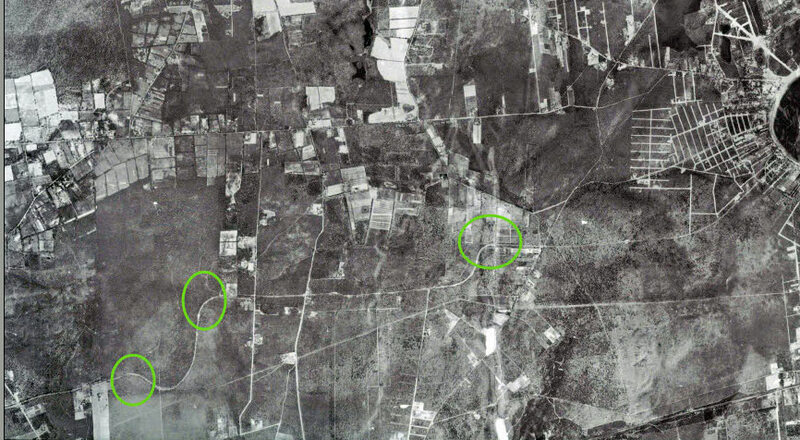 This matches the 1924 aerial showing the Wheeler farms to the north and south. The downward slope that appears to be a bridge embankment would make sense before that turn, possibly being the Wheeler farmway bridge for those possible farm fields. 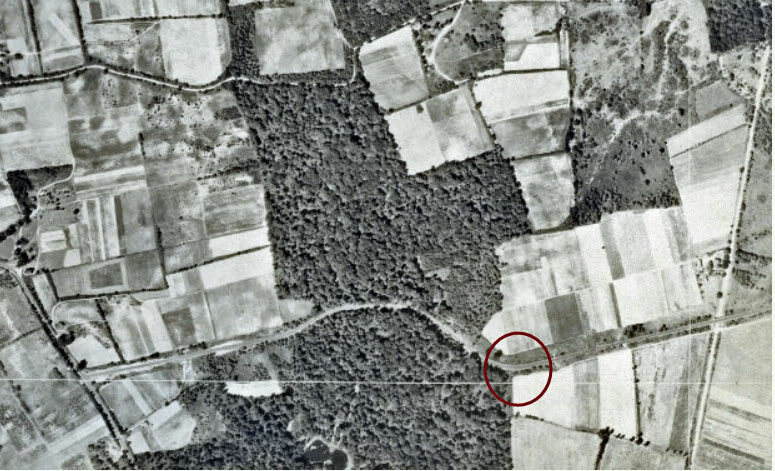 A clear, defined tree line stretches very broadly from border to border in the distance of the mystery photo without a man-made structure in sight. This tree line starts directly on the outside edge of the curve. Again, all this matching the 1924 aerial. All the depth of field and perspectives seem to match, (taking into account lens length as photographers can tell you). With the NYCmap link where the original, interactive aerial can be found, you can zoom in very tight on this section and I even went so far as to try to identify the smaller, individual trees, but smaller trees can differ between 1924-1928-ish. I’ve been still trying to match other areas of the parkway, but the more I look at the other turns, the more I’m convinced it’s probably West of the Wheeler bridge. The steep embankment on the sides in addition to the sharp turn (some of the guesses above don’t work—this right hand turn is sharper then some of the choices above) and the foliage led me to believe my location guess of entering into Wheatley Hills Golf Course was a very good one, however as per our earlier post of this section of LIMP I forgot that this location had the concrete extensions on both sides which made me wonder…..
Why were these concrete extensions only in certain places and not others? Or were they added at a later date to some locations? And does this information help us narrow down this mystery location? 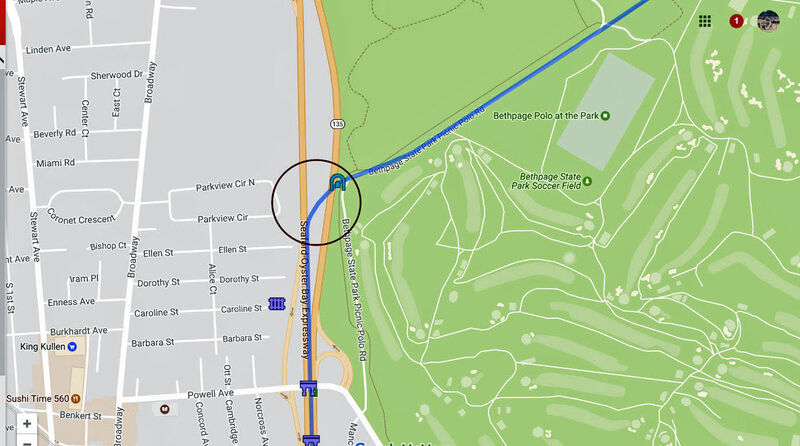 Dave – The original parkway section between Meadowbrook Lodge and the Bethpage Lodge was 22 feet wide. 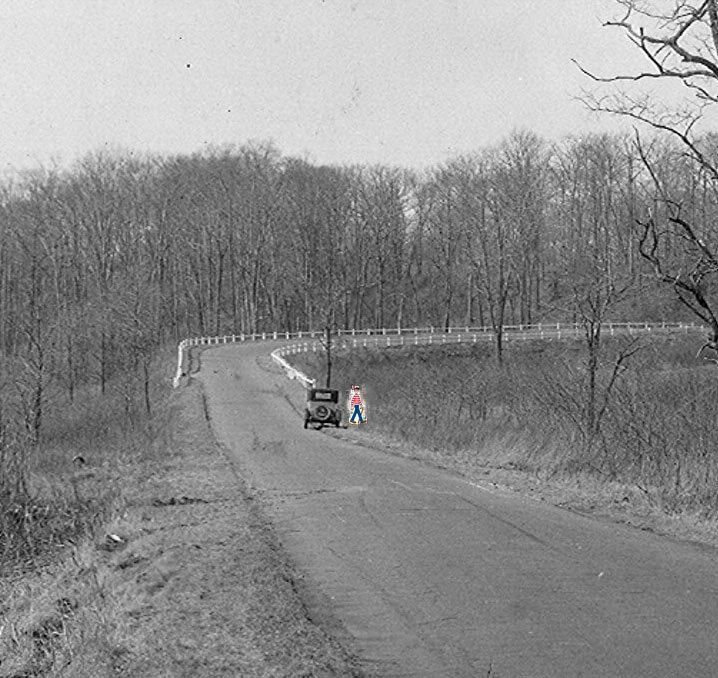 As the parkway grew westward and eastward in 1909, the new roadways were only 16 feet wide. The concrete extensions were later added in the ‘30s. Greg – It’s difficult to determine what degree the mystery curve is. The curve west of Wheeler bridge #2 is about 45 deg. I’m increasingly believing you have the right location, but the mystery photo was taken just west of Winchester Blvd bridge’s west embankment on the down slope, as the Wheeler farmway bridge is already in the mystery photo on the up slope. The WC Fields movie photo looks very close to the mystery. The solution search is getting hotter! Frank, I have to completely agree with you. There was one thing that was bugging me about my own guess that your explanation addresses, and that was the white gaurdrails. If you look at Howard’s post on the LIMP bridge series #7 from Sept 8th 2011, it shows the only ground level photo of the Wheeler bridge #2 in 1932. In the photo, the bridge has the gaurdrails (my original thought was they were added between 1928 and 1932) but the hypothesis that the rails were there also fits. Also, from the ground level photo, you can see there is an incline going over the Wheeler bridge similarly as in the mystery photo. I think we can pretty much call this one ‘solved’ with the confirmation of the W.C. Fields film. You can see the upwards slope of the curve on the ground view Wheeler Bridge photo. Greg O.- I was looking at that same blog about the Alley Pond Bridge from 2011. This sounds funny, but there’s 1 tree on the N/S of this farmway bridge; east side. This same tree is in this mystery photo. Uprise begins after where the auto is parked. It would be great if the “Tall Cylinder” seen in the 2011 blog was in view with this mystery photo as well. It would be in view if the photo was a little more to the north. Being that I live in Lake Ronkonkoma, I field checked the proposed Suffolk locations ( including mine ). The locations appear convincing from an aerial map. They all had aspects that didn’t quite add up. Especially the curve after Bedford Ave. It’s actually more like an “S curve”. The Deadman’s Curve of Suffolk County. 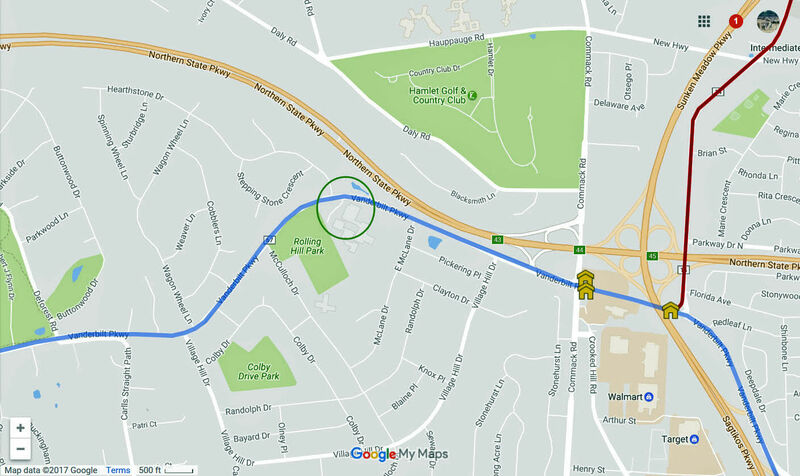 I was even proposing in 1 of my comments that this could be the straightaway and east curve across Bagatelle Rd/Conklin Ave. I know Art Kleiner has hiked around there in the past, and would know this area better than the most of us. I didn’t try checking this out today along with the other Suffolk locations. Ran out of time, and really wasn’t convinced with this location anyway. 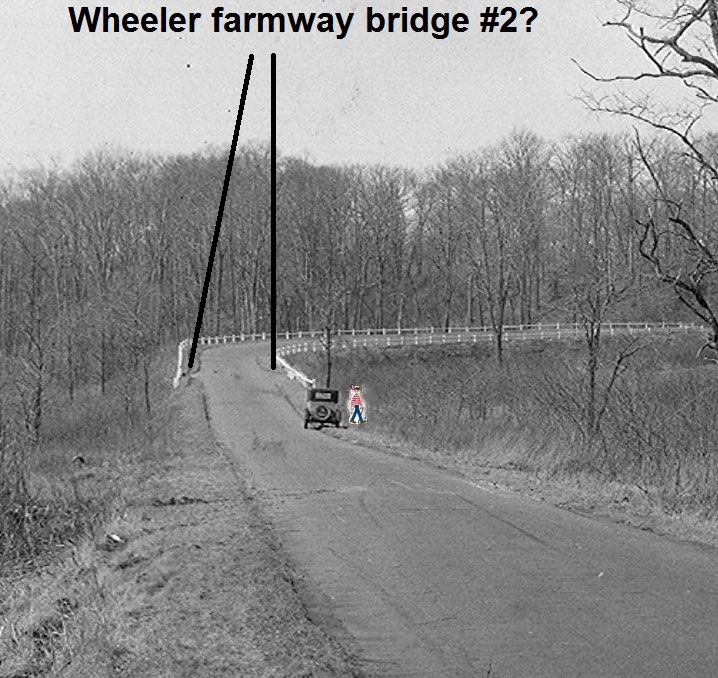 Howard’s series 7 review of Wheeler’s Farmway bridge #2 clearly shows the bridge’s downward slope in detail (Thank you Howard, Greg Oriero, and Joe Oesterle). The mystery solution appears picture perfect at this location. I’m almost convinced. Any other thoughts are most welcomed! Thanks for adding my thoughts about this mystery, Howard. I forgot to mention another clue. *E/O. Springfield Blvd…. Just as Wheeler Farmway Bridge#2 is in view W/O Winchester Blvd, Wheeler Farmway Bridge#1 would be in view as well E/O Springfield Blvd. But I havn’t been able to locate a GROUND LEVEL view of the Bridge#1 as it would look in 1928,etc. First: What fun this mystery is! 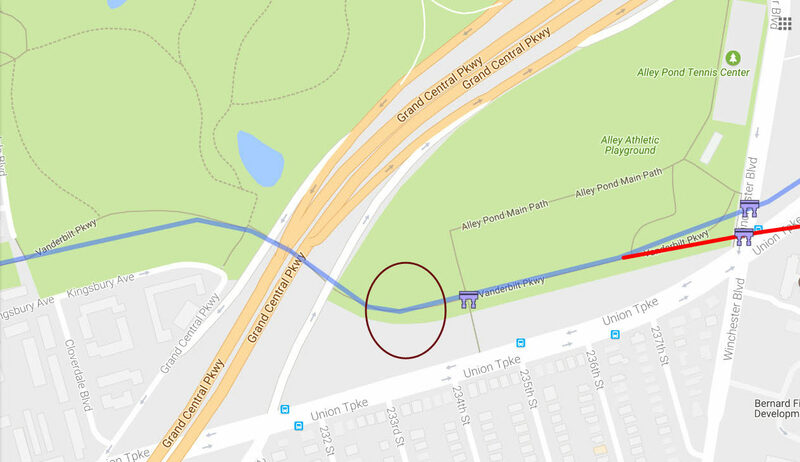 Second: That W.C. Fields movie of driving on the Motor Parkway is the closest scenario to truly experience what driving on the Motor Parkway really was. I’m ecstatic it’s still available for all to see. Please keep this link available. I believe Greg O has nailed this tough mystery ( with the help of Joe O ). After Brian McCarthy’s on-site observations of the multiple mystery guesses throughout Suffolk County, all showed some flaws comparing to the mystery photo, including my own guess. Nassau County was not analysed. Greg’s solution still persists. The mystery photo and the movies’ still frame seem to match identical. Any thoughts are welcomed, please join in. Thanks Frank. I’d like to think that after following Howard and Sam’s sites, and talking with Al V. as much as possible for the last 10 years, I’ve had at least a little bit of all their extensive knowledge sink in with me! As far as the “Tall Cylinder” seen beyond the treeline in the 1932 photo of Wheeler Farmway Bridge #2 ( Ground level photo ), I guess it’s a Farm Silo? This photo was taken in a NNE direction. 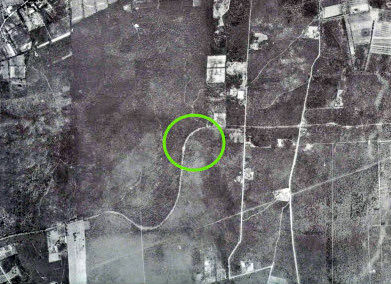 When I compare this photo to the 1924 Aerial W/O Winchester Blvd, the Silo should be just past the small tree line. No matter how much I zoom into the 1924 aerial, I can’t make out the silo. No matter, I think you nailed this mystery, Greg O.
Brian - The farm silo was covered by Howard at some point I remember. My initial search came up empty. I believe it was a water tower in the distance? Not sure. More searching is needed. Comment #32….The 8/24/11 blog LIMP Bridge Series #10. Commonwealth Blvd Bridge. 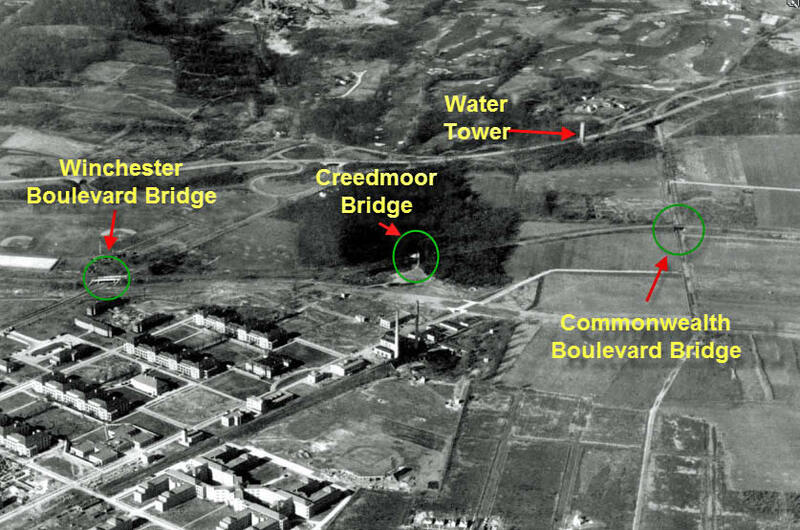 There’s a 1928 photo of a water tower that’s North and West of Commonwealth ( Winchester Blvd is the next main rd W/O here ). This tower looks much like the 1 in the 1932 Wheeler Farmway Bridge #2 ground photo. Must be the same tower in each photo, Frank. The tower was eventually taken down with further expansion of the GCPkwy. ‘24 aerial but does appear in the ‘51. Check out the northerly shadow casting over the GCP! Frank- Correct me if I’m wrong, but the water tower you are referencing in your aerial photo link is EAST of the Winchester bridge near Creedmoore. The Wheeler/Alley Pond Bridge in question is WEST of Winchester, so I’m not sure that is the tower. Frank-my apologies. My first thought was the tower was too far East to be seen in the ground level view of the Wheeler/Alley Pond bridge. After looking at Brian’s 8/24/11 blog LIMP Bridge Series #10 ground level Commonwealth Blvd Bridge photo, and looking at angles and perspectives, I’m pretty convinced now that that it indeed the water tower. Howard….. Correct me if I’m wrong, but I think this blog has more comments than any of your past blogs? Below is the solution of the Friday-mystery. Although I suppose it was not too difficult and maybe lots of material is already available, I attached for sure some extra documentation! The car is a 1904 Columbia 30-35 hp with stripped body, which brought the Chicago-New York record down to 58 hours and 45 minutes. The car was driven by Bert Holcomb, Lawrence Duffie and Eddie Bald, who joined the other two in Cleveland. The start of the record run was on Tuesday, October 4th 1904 at 2 am and the run ended on 39th Street in New York on Thursday, Oct. 6th at 0.45 pm (the text on the banner reads 58 hours 35 minutes, but that was the time only until Weehawken ferry). Although the record run itself a lot was written in the magazines, about the fact that the car was present on the Vanderbilt race track almost nothing. A small article in the New York Times reported that the crew and car drove on to Garden City ‘after a brief rest’. On the photo the Columbia is standing at the Vanderbilt course near the start/finish line with the timers’ and judges’ stand in the background. I assume that the photo was taken on Friday, October 7th, the day before the race: it is still very quiet and clean! Looking north from north 27th off of Colonial Springs Road. Treeline is still there. Sight of proposed development of 264 rental units.